My father іs a heart and soul Ukrainian. I love the fact that my dad is Ukrainian. His blood runs in my veins and thanks to him I am half Ukrainian as well as half Estonian owing to my mother. He has been singing lullabies and teaching me Ukrainian songs since childhood. But we live and observe two sets of folk traditions. Our family celebrates all Ukrainian and Estonian national holidays. Two years ago, grief entered our home, same as every Ukrainian family home. The Maidan, the Heavenly Hundred, the war… For the fi rst time ever, we learned about death. We learned that the coun- try must be protected. We learned that people died for peace and freedom. My father wrote the song and dedi- cated it to the Heavenly Hundred and Maidan. My younger brother and sister and I study Ukrainian, Estonian and English. Each language enriches us and enables to learn more about the world and to tell others about ourselves. 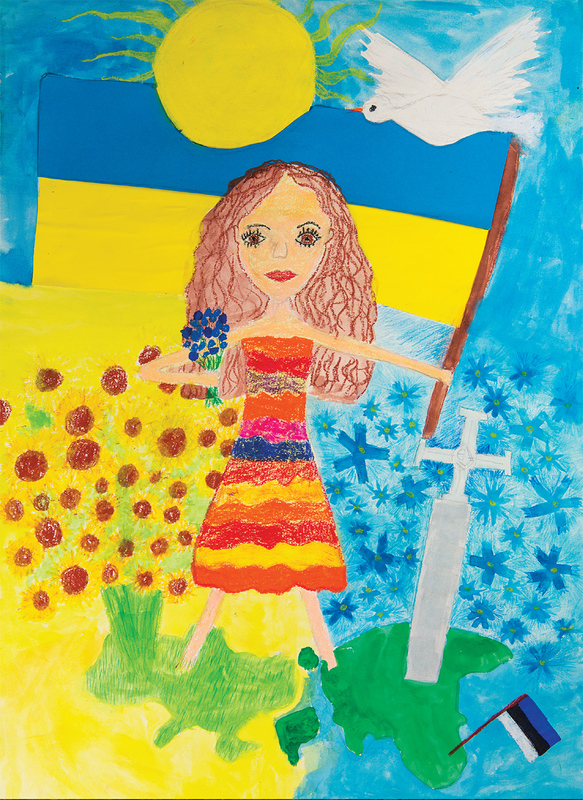 I dream and doing my best, as does my dad, to make Ukraine such a country. I drew myself in the center with the flag in my left hand – right by my heart. I am holding a cornfl ower, the symbol of Estonia, in my right hand. The sunfl owers represent the sun and Ukraine. The bird is a messenger of peace. My feet are on the maps of Ukraine and Estonia, where I came from. I want to get my message across to Ukrainians: Estonians help, understand and sympathize! Glory to Ukraine!